Video quality depends on allocated bandwidth per stream which must fit in the limits of the connection upload speed for broadcaster and download speed for watcher. Higher resolution requires more bandwidth to show a clear picture without much pixelation. More pixels require more bandwidth. Higher video bandwidth setting will reduce required compression level and pixelation on movements but will require users to have higher connection or will cause massive frame loss, interruptions, big latency. 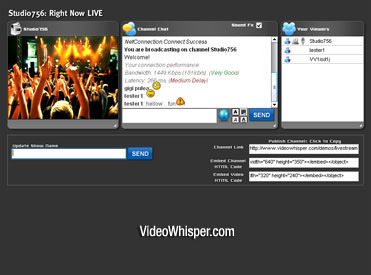 When streaming live video with static background as for webcam performance, video calls, conferences, concerts or shows the bandwidth requirements for streaming good quality is usually lower. Much lower bandwidth can be used when there’s low motion (try half) but pixelation can occur on certain moments when there’s higher motion or change of background, lighting. Videos with lots of motion, changing background, scenery, require higher bitrate. These bitrates are recommended for preventing pixelation in full motion scenes (like sports, movies, action games). Lower bitrate can be used for streams with lower level of motion (in example for presentations, conferences, calls with static background). Bitrate is usually in bits (8 data bits = 1 byte space). Obtain generated transfer by diving bitrate to 8 bits/byte. Ex. 8Mbitsps generates 1Mbyte/s transfer (1000000b/s) and file size when recording. When broadcasting, total stream size should be less than maximum broadcaster upload speed. Do a speed test from broadcaster computer to a location near your streaming (rtmp) server using a tool like SpeedTest.net . Drag and zoom to a server in contry/state where you host (Ex: North America if you host on VideoWhisper video hosting servers) and select it. The upload speed is the maximum data you’ll be able to broadcast. To obtain kb/s from kbps divide by 8. In example 400kbps is 50kb/s (50 000 b/s). This is required when configuring streaming applications in b/s. Number of streams consumed for each user connected to server depends on communication logic. For 1 way broadcasts each user consumes 1 stream. If there are 2 way private video chat rooms where each user sees 1 other video and transmits 1 video, 2 streams per user will be required. If there are video conference rooms where each user transmits 1 video and sees other 3 videos, 4 streams per user will be required. To host hundreds or thousands of streams simultaneously, servers with 1000Mbps connection are required. It’s important to have the server in a reputable data center with high connectivity so all your users can connect to the server at good speed, from their different networks and providers. To evaluate server and network capacity when choosing a server, consider monthly transfer available. 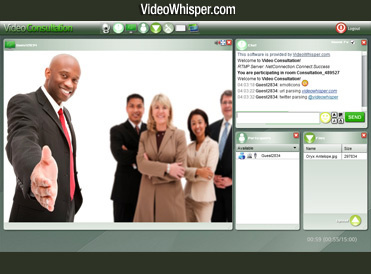 In example, VideoWhisper dedicated video streaming servers are setup to allow 100Tb/month data traffic which means around 308Mbps average continuous transfer. A provider selling servers with 10Tb/month is ready to handle around 30Mbps average transfer and if server allows only 5Tb/month your project should not require more than 15Mbps average transfer. On high traffic events, servers could handle spikes up to double or more of this average bandwidth only if network load is low at that moment. Reliable services should be planned based on provider network capacity.